Sylvia Hamilton grew up in the United Church of Canada, and was an active volunteer, providing leadership in Church School. She was the first woman to be Sunday School Superintendent at St. George’s United Church in Toronto. Sylvia was trained formally in education and taught Home Economics in Brampton High School, and soon moved to Toronto Teacher’s College to teach home economics and to be Dean of Women. Because she was married, she never attained the status of “master”, being instead an “instructor”. Her paid work went on hold while she raised her three children, but she continued to volunteer and study in the church. 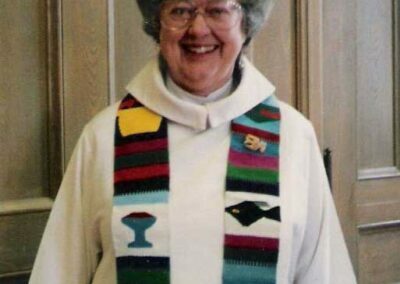 In her words, “I felt a call to a more committed role in the church after 30 years teaching Sunday School.” In the early 1970s she began her work in lay ministry as a staff associate at Eglinton United Church in North Toronto, and also began her studies at CCS. In 1979 she completed her 5 years of part time study. After becoming a “Commissioned Minister” by action of Toronto Conference that same year, Sylvia continued her Christian Education position at Eglinton, a large congregation with a multiple staff team. She pointed to several highlights of her time at Eglinton: working on the issue of sexual orientation and acceptance of lesbian and gay people into ministry, developing and sustaining pastoral care teams, participating in the Sunday morning women’s group, working on issues of peace and justice through Amnesty and other projects. In one of the most prestigious pulpits of its day, filled by high profile men, Sylvia held her own with a preaching style that was invitational and educational. Sylvia experienced the harshness of sexism as a woman in the male dominated world of upper class Toronto. Although she was frequently the presider at funerals, when the local funeral home held their Clergy Golf Tournament, she wasn’t invited. She “retired” from this long term pastorate in 1993. She then ministered at Windermere, Runnymede and Royal York United Churches. In these positions her work was primarily with seniors. She truly retired at age 75! after 33 years in ministry. Sylvia’s exceptional skills at working with and empowering people brought her great success in pastoral and educational ministry. She was often called upon by CCS to resource student learning on teaming in ministry because of the remarkable ability she had demonstrated to work effectively with a large number of people. Over 3 decades, Sylvia was a supervisor and mentor to CCS students, companioning them in their learning with patience, good humour and gentle encouragement. Frequently she continued to mentor them throughout their careers. In her retirement, Sylvia maintained her long pattern of volunteering for numerous churches and groups. She was the first woman chaplain of the Toronto St. Andrew’s Society, and President of the Society and volunteer chaplain at St. Matthew’s – Bracondale Seniors Home. 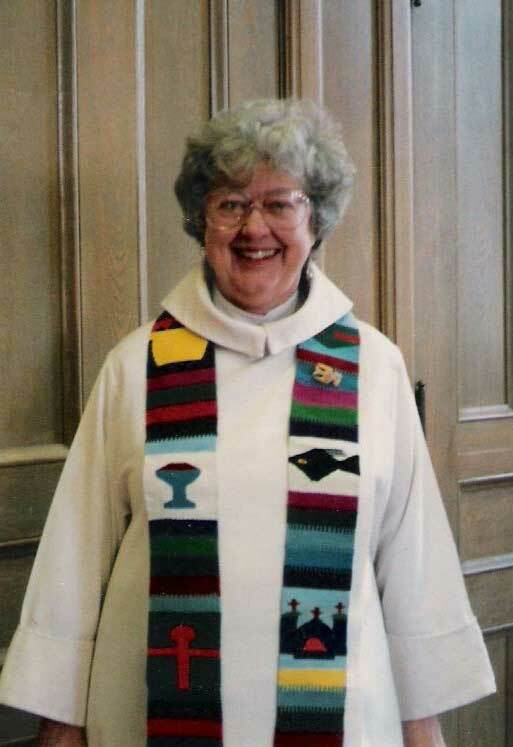 Over the years she was involved at all levels of the United Church including chair of pastoral relations in Toronto South Presbytery, chair of the General Council Nominating Committee and a member of the General Council Executive, member of the National task group on sexual abuse and author of many educational materials. Sylvia had a sophisticated faith. She was stimulated intellectually by nuances in theology. She was accommodating of others, encouraging them to express their viewpoint, but she was uncompromising on a theology of justice and empowerment of the disenfranchised. In 2007, Sylvia was named as a Companion of the Centre for Christian Studies. There were already signs of memory loss, but in accepting her honour she was radiant and exuded the grace and charm that had helped her to draw in people unsuspectingly, until they found themselves changed by what she had taught. 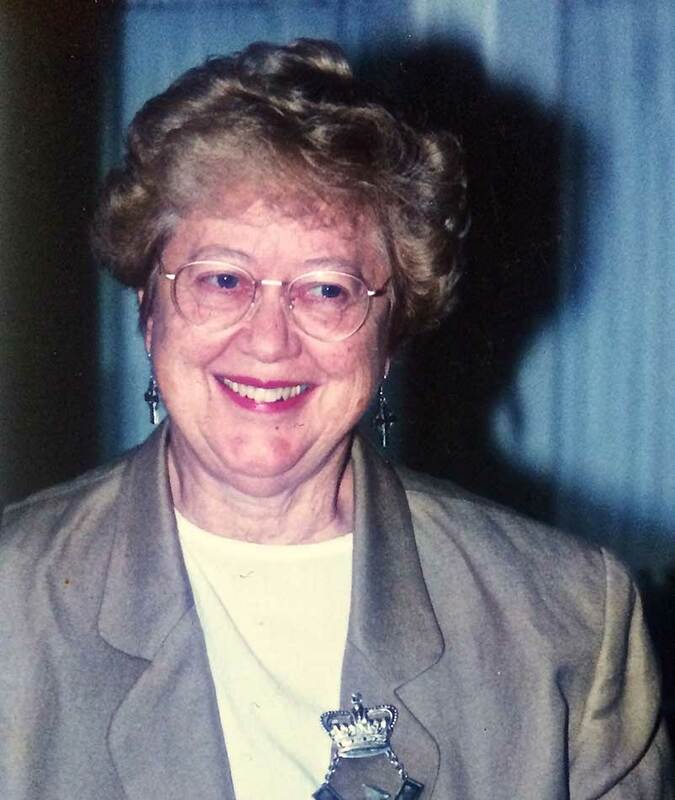 Sylvia died peacefully in her 87th year on March 7, 2015.